Banana bread is such a classic and delicious dessert! And we have the PERFECT recipe for you! This recipe will give you yummy, mouth-watering banana bread in under one hour! Banana breads are so common but finding the right recipe on the internet is such a pain! But don’t worry, we have the PERFECT recipe for you!! It’s super simple, and the steps are clearly stated so you’re not confused at all! Plus, we have special chef tips for you to make sure you make the recipe with as much ease as possible!! ? Hi guys! 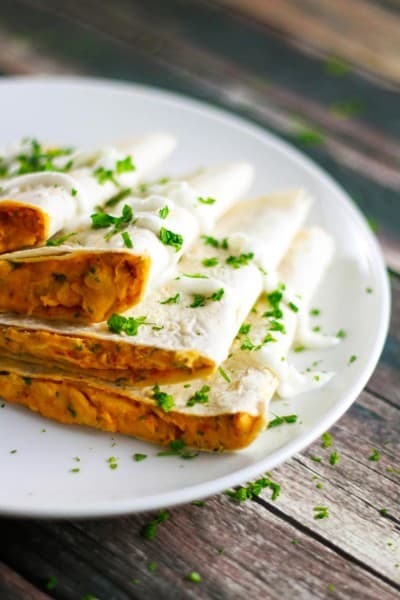 We have a classic recipe for you guys today! When I was a kid and living in Kuala Lumpur back in the 90’s, there used to be this particular bakery that sold the most delicious banana bread ever! I still remember my dad going there on the weekend early in the morning and getting a couple of freshly baked banana bread loaves for us. They smelled divine and the taste was incredible!! Ever since then, I’ve always been trying to make the perfect recipe and replicate the flavors as much as possible. And if I might say – this tastes EVEN BETTER!! Trust me, whoever tries this when you make it, will fall in love with the banana bread (and YOU!!). Follow this recipe to the T and you should have the perfect banana bread ready to eat in under one hour! Here are a few chef tips for you from us to make sure you have the smoothest time making the banana bread today! This recipe calls for baking soda as well as baking powder. Don’t confuse the two – they’re a bit different. Baking soda is usually used in recipes which call for a fruit or vinegar. You can slightly increase the amount of sugar that I have written from 1/2 cup to 3/4 cup (or even 1 cup if you really want a sweeter bread) in case your bananas are not very ripe. If you don’t have ripe bananas and want to ripen them as soon as possible, heat your oven at 240˚F and put the bananas in the oven on a tray for 15-20 minutes. The catch? They’ll look a bit unappetizing because the peels will turn black but the bananas will be just perfect for this recipe! If you have a few days till you’re about to make this recipe, then put your bananas on top of the fridge and leave them for 3 days – trust me it works perfectly! EDIT: Our beautiful reader Sue asked this question and we just had to include it here. She wanted to know if you can substitute brown sugar with white sugar. Well, you absolutely can! The only thing you need to know is that brown sugar is naturally more moist than white sugar and hence by adding brown sugar, your banana bread will be more moist and hence softer. You can add about one tbsp of fresh plain yogurt to the mix with white sugar in case you use that instead of brown sugar! P.s. It’s a myth that white sugar is sweeter than brown sugar! So let’s go to today’s delicious recipe! 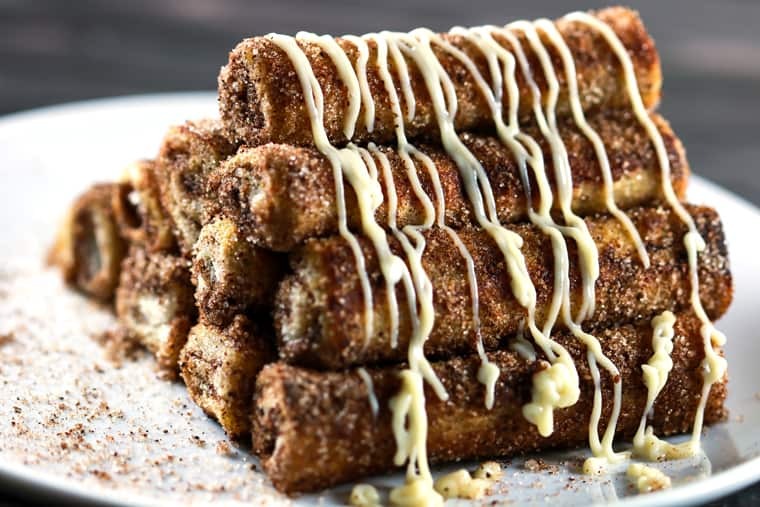 If you loved this delicious Banana Bread recipe, then you’ll definitely love our Cinnamon Roll French Toast Roll Ups recipe! It’s extremely easy to make and tastes exactly like cinnamon rolls – but minus all the hassle. Plus you don’t even need an oven for it! Hi Sue!! So happy you want to bake this one. Yes you can definitely use white sugar instead of brown sugar – only difference is that brown sugar is naturally more moist – so it’ll end up making your bread more moist and hence softer. P.s. You can also add about one tbsp of yogurt to the mixture to make it softer if you feel the substitution will make it not as soft 🙂 Also, don’t worry, it’s a myth that white sugar is sweeter than brown sugar. Thank you so much for the super fast response. I have asked my husband to bring home brown sugar as a moist loaf will be much nicer I’m sure. I have waited days for my bananas to be ready and your recipe appeals to me so much more than others, not to mention the pictures are fab. I will let you know how it turns out! Haha, I know exactly what you mean – but that’s why I actually figured out a way to make the bananas ripe real fast for the recipe! I’ve detailed it in the Chef Tips section (check out tip number 3 :D). Aw! Actually Arvin and I believe that ANYONE can be a chef without formal culinary education! And that’s exactly why we’re changing up our blog in the next two-three weeks and including a section where we teach everyone how they can create their own recipes from scratch – the easy way! Trust me, it’s all about understand just a few little things and then you can be off on your own. For e.g. anyone can make a cake – you just need to know how much of fat, dry ingredients and liquid to add total. You can then make any combination of these and it’ll be the perfect cake each time! But someone no one wants to reveal these tips! SAMOSA!! ? I unfortunately don’t have any recipe up but if you want, I can write one down here for you or email it to you – if you haven’t found a delicious one already! We both have a bit of Indian blood and these spices are right up my alley! Short form: add red chili powder, a bit of turmeric, garam masala and cumin – that’s the basic Indian spices! But I can totally send over the exact amounts to you. Hi Sue!! I was just writing the email to you with the Samosa recipes! I can’t believe I missed that step out of the recipe – you add it after step 3 but before step 4 (i.e. before adding in the mashed bananas). Add in the egg and essence and blend it a bit so it mixes completely. Then proceed with step 4. I’ll edit and add this step into the recipe too! Not a problem AT ALL! I enjoyed writing those recipes down for you! (I’ve sent three different samosa filling options too!). Hope you have a great time making the samosas!! I’ve sent them just a few minutes ago on your email address! Omg – freshly made bread is my weakness. Just the smell of it alone can send me to bread heaven! Oh and WOW. That’s a proper feast! Your in-laws are super lucky to have you as family!! ? Have a beautiful dinner with them and the family tonight!! x.
Haha I just had to reply to this comment! I loved the way you explained that hahaha! I TOTALLY understand what you mean – I recently moved to KL, Malaysia from Dubai and it’s all so confusing here too at times! I mean one of the toughest ingredients to find fresh here is coriander ? I mean I NEED THAT. And the bicarb issue exists here too hahaha! Anyway, I’m absolutely sure you’ll love the samosa recipes I’ve sent (and so will your husband!). You can be creative and add any other vegetables that your husband might be fond of – e.g. some people add peas to the minced meat one! But you have all the basics and I’d really encourage you to add in whatever else you like and make the recipe YOUR OWN!! You can make brown sugar from white by addind molasses. 1 tbsp molasses to 1 cup sugar. I am planning to make your banana bread. I am wondring if the brown sugar should be packed in the measuring cup? I hope that made sense! In case you’re confused let me know and I can maybe send you a mini video or something to explain it better! I made this tonight and it is truly my favorite by far ! The only thing I did different is to put some chopped pecans in it. I will definitely be making this again as it was so easy! YAY! So glad you enjoyed the recipe – I usually always make it on Sundays and finish it the same day (HAH!). Do let me know if you have any specific requests for our next recipe!! I have no shortening or spray to coat the pan, can I line it with parchment paper. I am making your banana bread tonight! I am looking forward to trying this recipe, but I’m adding chocolate chips, because honestly, who doesn’t love chocolate and bananas!! Anyway, I just wanted to let you know that I enjoyed reading the comments! I like to search out the comments so that I can see how other people liked a recipe, and I have to say, I very much enjoyed the comments!! Thanks for being so personable! It makes a huge difference for me! Hi Nellie!! Guess what? It’s a Sunday here and I’m baking this same banana bread too 😀 It’s almost like a ritual haha – I always do this on Sundays. You’re right chocolate and bananas go so super well together – one of my favorite combos! I’ve added so many different things to this recipe and tried it in different ways – it always turns out delicious! Really hoping you’ll love the recipe too 😀 I just wanted to put out the basic recipe for everyone so they could make it their own by adding different ingredients on top like chocolate chips, pecans, walnuts etc. So yay! Go ahead with your creativity and make this YOUR OWN recipe!! Oh by the way, in case you run into any issues while baking, please do comment here or email me at [email protected] and I’ll reply back asap (unless it’s the middle of the night for me in which case I’ll reply back as soon as I’m up!). If I wanted to make this as muffins instead, I’m guessing I’d need to adjust the cooking time? Let me know if you have any other questions – you can comment here or send me a direct email at [email protected]! I’ve had a friend bake these into muffins in the same way and it turned out great for her! I love this recipe! My kids thought it was great! This might seem small but thank you for making your printed recipe one page with no pictures! It’s beyond annoying trying to print recipes that come out 5 pages long. Thank you! Hi Trish! YAY! I’m so happy your kids enjoyed this! This is a recipe I created to relive a childhood memory of mine! Please do let me know if you have any specific recipe requests! We're both chefs and have learned to create just about everything in the past few years - can't wait to share it withe everyone as we go alone!! Have a lovely day Trish! I just made this and my husband and 5 year old daughter loved it. Thank you for sharing thise recipe, Godspeed! Thanks for the beautiful comment – it made our day! Please do let me know if you have any recipe requests – I’ll definitely put it up right away! Love banana and this cake! Great recipe….I changed to 1/2 cup wheat flour….and added about 3/4 cup smashed strawberry’s. I was great…..all loved it!! Hi, I’m trying this as,we speak! Thanks, and I cant wait to try it, yummy! Made this for a coworker who gave me some ripe bananas and the whole office loved it! Making it again tonight for breakfast throughout the week! I added a little brown sugar on top right before placing it in the oven, it gave it a little crunch. Perfect recipe 👌🏻!!! Hands down the best banana bread I’ve ever made. Texture is so moist, the first bite of this bread just melts in your mouth. Super quick and easy! This is MY banana bread recipe. It turns out perfect every time. I was wondering if I could make it as muffins or would I need to make adjustments? I made this with white sugar and used a half container of vanilla Yoplait Whips. Everyone said it was by far the best banana bread they have ever had. I did have to adjust the cooking time by 10 minutes. I dont see a step in the instructions about the baking soda and baking powder or salt. Hi Nicole! I think you might have missed the second step – it says: ‘Sift flour, salt, baking powder and baking soda together.’ 🙂 Let me know if you have any other questions!